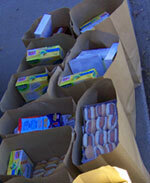 One way you can help your community and CAP is by donating food items and supplies. Please help CAP keep our shelves stocked for our needy friends and neighbors. Below is a current list of needed items. Please note that due to health department regulations, all food items must be in factory sealed packages and we suggest individual sizes on some items.